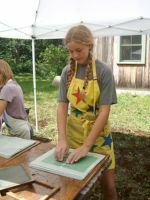 Kids, make your own sheets of paper this summer at a papermaking studio. 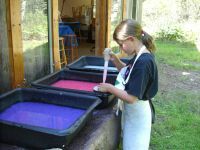 Get your hands wet with pulp as you pull your own sheets of paper in different colors, shapes, and sizes! Experiment with a turkey baster, squeeze bottle, cookie cutter, or yarn to make pulp designs and decorate your paper. 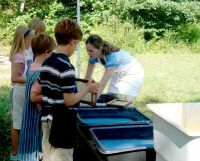 This workshop introduces you to the world of papermaking and various techniques used by papermakers. When your paper dries, you can use it for writing letters, drawing pictures, making books, or something else. What will you do with yours? Yes, you can make paper from old jeans! Denim pulp will be one of several vats of pulp used to pull sheets of paper in this class. Feel the difference between the denim fibers and the other fiber. Experiment using pieces of denim and denim strings in decorating your paper. Seaweed, seaweed, and more seaweed! In this class seaweed will be mixed into one of the vats of pulp. Explore the magic of seaweed as a decorating technique on your paper as well. 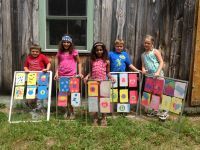 Create designs from a variety of seaweed. A vat of pulp with floating flower petals will be in this class. Experiment with different flowers, grasses, and leaves to decorate your paper. Create patterns, gardens, beach scenes, or abstract images using botanicals.